October was mostly warm and dry, so coming into November we're excited about some wetter weather. It hasn't been much yet, but the Umpqua is beginning to rise so it's looking a lot more like fall around here. The drizzle has started to knock the yellow leaves off the vines too so before long they will be bare and settled in for the winter. November is gearing up to be an exciting month. 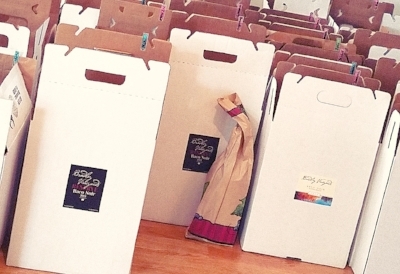 I'm most looking forward to our first ever Wine Club pick-up party! It is set for Saturday, November 28 and I'll be serving food pairings and glasses of wine to our members. Plus, as a thank you to our first members, we're offering a very special library wine. So if you have been thinking about signing up and just haven't done it yet, I recommend doing so today! Also, I wanted to remind you that the weekend of November 27-29 Elkton will be having our annual Art & Wine Thanksgiving Weekend. Seven artists studios and shops will be open; all five Elkton wineries will be pouring; ECEC - home to the butterfly pavilion and Fort Umpqua - will be open. It is the perfect excuse to get away, do a little holiday shopping in this peaceful and scenic nook of rural Oregon and support local artists and artisans alike. Check out the handy-dandy map in the right column to help you plan your trip and navigate your weekend. I do hope you join us! Following the Thanksgiving weekend, I'll be closing up the tasting room for the winter months, but if you are coming to town and would like to taste, I would be happy to catch up and pour for you. Just give us a call or email to set up a private tasting! Wishing you a warm and happy November and I hope to see you soon.